I needed to do some research before I used it because I wasn’t overly familiar with the eliquid. I don’t know what your stance is on the whole cannabis argument, but I’m all for it. Legalise it. I’ve been to Amsterdam and I had a whale of a time. I personally believe that there are many benefits to be had from cannabis, despite the bad reputation it has, and it seems I’m not the only one. It’s a debate that really does cut the nation in two. Some think it’s a dirty drug, in the same bracket as all the other dirty drugs – crack, heroin, cocaine, etc. Some don’t think it’s that kind of drug at all. If cigarettes are legal, and alcohol too, why isn’t cannabis? I’m in with the latter. I don’t really understand why it’s still illegal here, especially when so many places around the world ARE legalising it. Anyway, I don’t really want to talk about smokin’ pot today. I want to talk about vaping with CBD eliquid. What is CBD eliquid / CBD oil? What does it do? Why would you want to use it? CBD oil is short for Cannabidiol oil. It comes from the cannabis plant, as the name would suggest, although it doesn’t offer the same intoxicating effects that smoking the leaf of the plant would give you. All the other stuff, however, the good stuff that cannabis is said to offer – that’s what *is* contained within CBD oil. All the benefits of cannabis, but without gettin’ high. There are different kinds of cannabinoids. The one that gets you high is called THC – Tetrahydrocannabinol. (What a name!) The type of cannabinoid that is found in CBD oil isn’t the same. That’s why you don’t get high. So, now you know what it is, why would you want to use CBD oil? A lot of research has been done into whether or not vaping with CBD eliquid (or using CBD oil / capsules) can help with anxiety, and the results seem to be much more positive than negative. Just one study alone included a group of people taking 600 mg of CBD had a much easier time when giving a public speech, or talking in front of people. A further study saw another group of patients taking a lesser dose – 400 mg – but still displaying positive side effects. Anxiety levels went down. This is all said to be because of the way the oil affects your brain, to be more specific, the way the receptors in your brain receive a chemical that your nerve cells produce – serotonin. This chemical is considered to be a natural stabiliser of your mood, and by changing the way the receptors of the brain receive the serotonin, moods can be lifted. This change in the way that serotonin is received means that CBD eliquid and oil can be used to help a number of mental health problems, including depression, stress, anxiety, post traumatic stress disorder, and more. It has even been shown to help with insomnia. Research is still going into whether or not CBD and CBD eliquid can help with cancer, but once again, although the studies are in their very early stages, the results seem to have been positive. It was the National Cancer Institute that showed early symptoms of cancer could be alleviated by using CBD oil, and also the effects caused by cancer treatments. They do not, however, endorse using cannabis as a way to treat cancer. It does make a little sense when you really think about it. CBD oil is considered to be an anti-inflammatory, much like Ibuprofen, and this can help to reduce some of the inflammation that often comes with cancer and the treatment for it. Not only that, CBD is also said to have a positive impact on the way that the cancer cells reproduce – it can help to slow down the growth of cancer cells, by stopping them from being able to reproduce. Not just apparently good for treating cancer, CBD oil can also help with pain relief, particularly if you have chronic conditions with chronic pain. There are actually pre-clinical studies going into whether or not cannabis can help with certain symptoms along with other cancer treatments, such as chemotherapy. Cancer and its treatment often come with lots of pain, and there is even a form of medication for Multiple Sclerosis sufferers that is a combination of not just CBD, but also THC. There are arguments surrounding CBD oil being used as a form of pain relief, mostly because it could be the inflammatory properties that work to alleviate the pain, rather having actual pain relief properties. Those who use CBD eliquid regularly, however, often say that using it has helped to reduce pain, which can only be a very good thing. The more cannabis is being researched, the more it seems they are finding more and more positive uses for it, particularly those with cancer and other, long-term conditions. As well as pain relief, anxiety, stress and depression relief, insomnia relief, and cancer relief, CBD oil has also shown to have positive effects for people suffering from acne, as well as a vast variety of other problems – Parkinson’s disease, Alzheimer’s disease, MS, and even stroke victims. It can help for those who would like the therapeutic benefits of cannabis, without the ‘getting high’ process, and I personally know of many entirely different situations of people using CBD oil and being met with very positive results. An anxiety sufferer I know uses CBD oil and has noticed a marked reduction in her anxiety upon leaving the house. I also know someone with schizophrenia who found vaping with CBD oil reduced his bouts of insomnia, and also had a calming effect on his “erratic swings”. The exact words he used were: “It smoothed me out a lot.” (Make of that what you will.) German researchers have also studied the link between CBD oil / other products and schizophrenia, and the results have been incredibly positive. Me, personally … I have chronic anxiety. You might not think that to look at me, but gearing up to record a video can take me DAYS sometimes. If you notice my sporadic recording, I’m sorry, but it’s because I battle my demons each time I get in front of the camera. I am the most camera-shy person you’ll ever meet in real life. I might be colourful and crazy, but I can’t really stand to be the centre of attention. When I was younger, I was a proper little attention-junkie. Anxiety changed me. As well as suffering from anxiety, I also suffer from chronic insomnia. If we want to get really specific about things, I also have a couple of gastrointestinal conditions – diverticulitis being just one of them. I do not take any medication for any of my conditions. Not a single one. Nothing for insomnia, nothing for the bowel conditions, nothing for the anxiety (or random bouts of depression I have been faced with). I don’t take pain killers. I don’t drink alcohol. I will hold my hands up and admit that I rarely have the odd cigarette, but each time I do I remember why I gave up smoking in the first place. What I’m trying to say here, is that I personally believe CBD has had a positive effect on my life. A huge one. I take painkillers twice a year, if that, and it’ll only be when I have the most crippling of menstrual cramps … (Sorry, men!) Do I put it down to CBD? Maybe, a little. I’ve been using it for a while (although this is my first CBD vaping experience) and I definitely think it’s caused improvements to my life. I don’t know where you stand on the cannabis argument, or the CBD one, but I do know that I would recommend this to anyone. I have done. I recommended CBD oil to two of the above personal experiences I listed, and look at those happy stories! Not bad for something that grows in the ground and doesn’t really need too much in the way of chemical interference … unlike most antidepressants. This VSAVI CBD oil came from VSAVI / Vapour2 (V2Cigs), and you can find more information / buy HERE. I vaped with 1% CBD e-liquid that contains verified Co2 extracted cannabis resin from selected organic farms in the subalpine regions of Slovenia and Croatia. I used it (straight from the bottle) in a V2 Ex Blank tank with a battery that V2Cigs / Vapour2 very kindly supplied for the job. HONESTY POLICY: This CBD eliquid was sent to me by V2CigsUK / Vapour2. I did not pay for these products. I was not paid for my review, and I will not be paid for my review. All opinions are mine and in no way influenced by the brand / manufacturer. 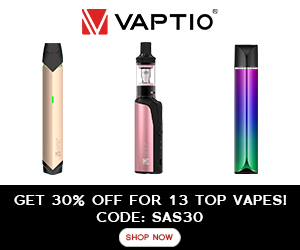 I will earn a small amount of commission when you purchase V2 Cigs UK / Vapour2 products using the links on this page, and also if you use the exclusive discount code: UKWORDGIRL. Thank you so much for your continued support! Wow Kim – that’s an epic and frank review and thanks as always for sharing! It is quite expensive. I didn’t realise how much until people pointed it out to me, but I think it’s worth it if you can use it from time to time. I’m looking more into it now, different brands and liquids and whatnot. I’ll keep you all updated, of course!